← Bike Fittings: Are They Worth It? I drove through scattered showers on the way to the start. Thankfully, the roads were dry when I arrived in Suffolk. Eight riders left promptly at 5am and rode into the darkness. Unfortunately, I had problems from the start. My fenders were rubbing, but only with a load on the bike. My SKS Raceblade strap-on fenders work well. But getting them adjusted can be tedious on a bike which lacks round tubes. They apparently were knocked out of alignment while the bike was in the trunk. My pre-ride tweaks were insufficient. It took a few stops to get them adjusted in the dark. 😦 This photo shows the Raceblades. The early stops meant I was the last rider with no others in sight within the first two miles. Consequently, I did what I do best by picking a grind and getting into it. I paced at 14-15 mph into headwinds and kept telling myself to conserve for the long ride… “Save the knees!” I was wearing summer attire. However, I was still carrying a rain jacket in case I got cold in the rain, a seemingly unlikely situation on a day forecast to reach 80 degrees. I was averaging about 14.5 mph. I stopped a few times between controls just to stretch a bit. My stops usually coincided with a photo opportunity. 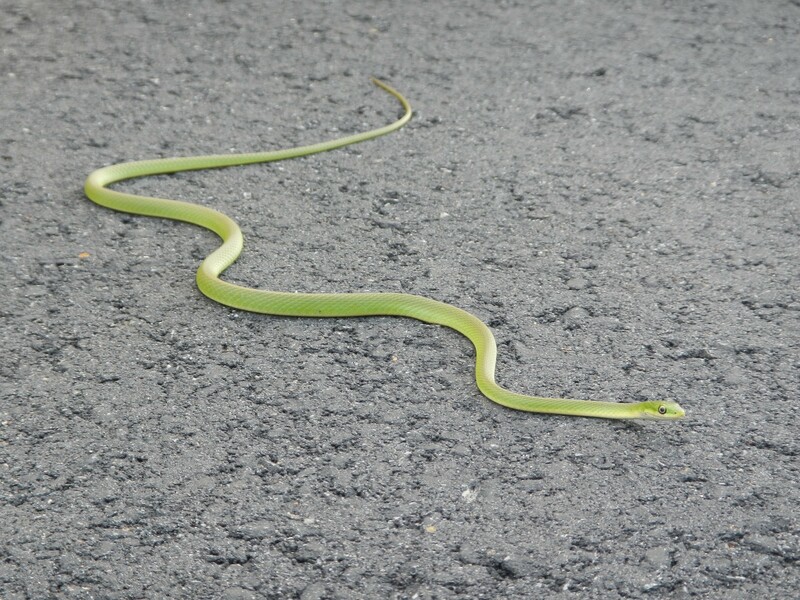 Here is the only live snake I saw all day. The ride was uneventful. One local rider asked, “How do you keep from getting bored on those rides?” Riding with someone REALLY helps. But it was only during the heavily fielded Wilderness Campaign 200km that I spent any considerable amount of time with other riders. I usually play tunes in my mind even though I can stream music. I was amused to find Bob Seger’s “Against the Wind” playing from time to time in the morning. 😀 Watching the cue sheet keeps my mind engaged and breaks the route into smaller segments. I have little choice but to observe the scenery when riding alone. 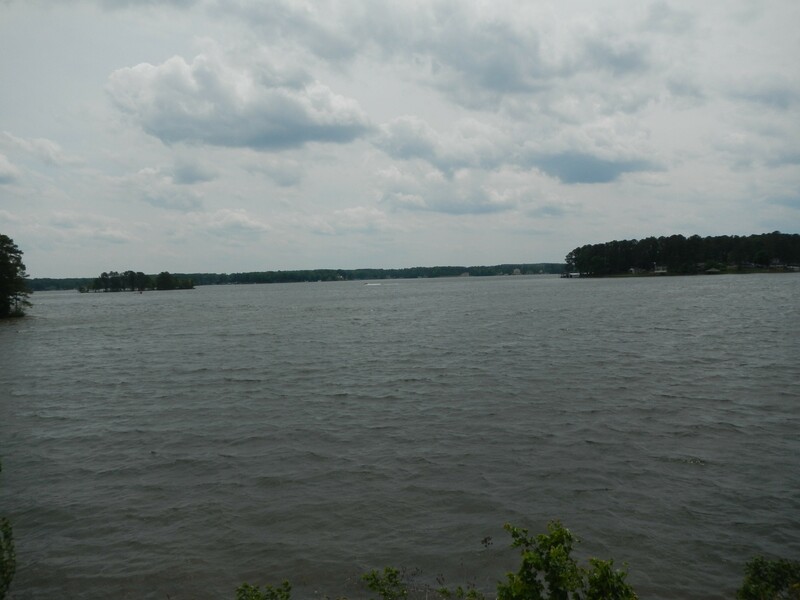 Lake Gaston is huge and offers a lot to see. 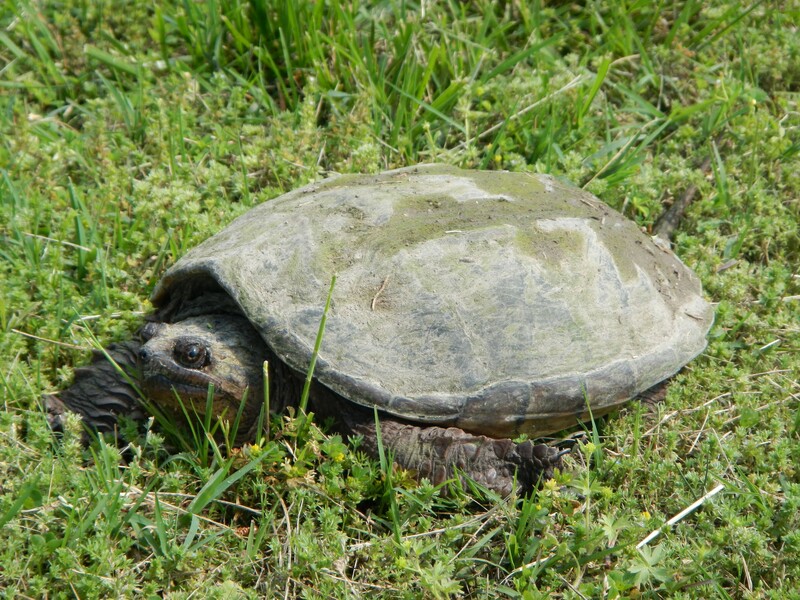 Seeing this large snapping turtle basking in the open was a treat. Staying focused at night is much tougher. I used a new Android app during this ride. 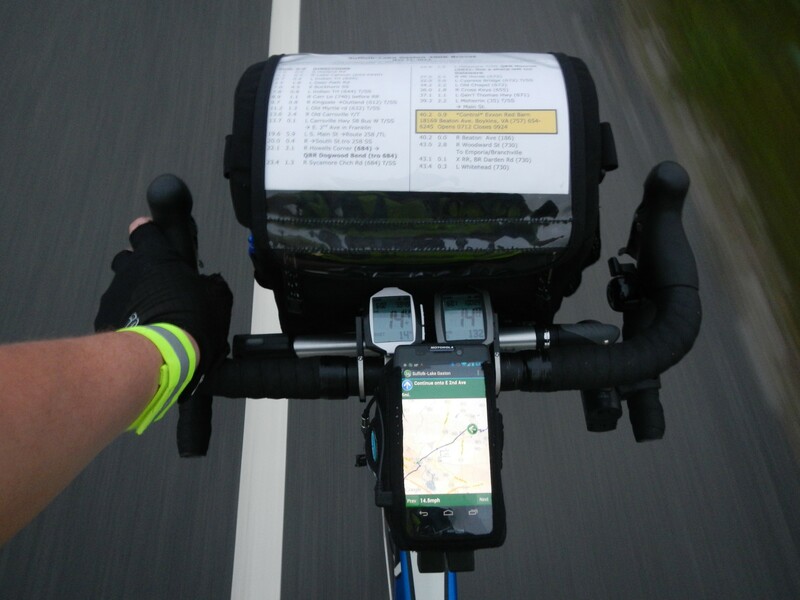 Someone created “Cue Sheet” for use with a RideWithGPS.com account. It worked flawlessly except for two places with errors in the programmed route (no fault of the app). The official cue sheet is the route. Cue Sheet made it really easy to know when a turn was approaching. In short, it announced an upcoming turn by direction and street name 0.2 miles in advance, announced again at the turn, and then announced the distance to the next turn by direction and street name. It’s really easy to listen to the text-to-voice prompts while checking the official cue sheet for accuracy. 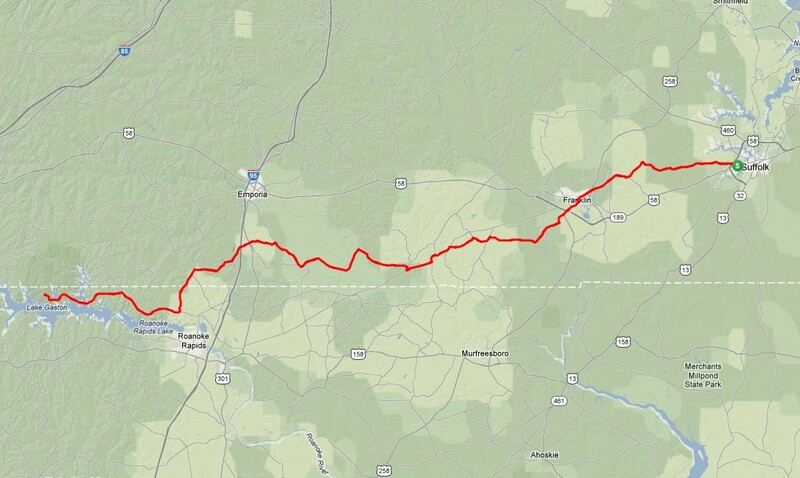 The hillier section between Skippers and Lake Gaston added some challenge to the route. The hills weren’t steep… just enough to reduce my average rolling speed to 13 mph. At the turnaround, I sat at a booth to unweight my feet, refilled my bottles and enjoyed an ice cream sandwich. Then I realized I was leaving the control point just 35 minutes before closing. “WHOA! I better get moving!” The ride back was a little easier since I had the wind at my back. Yes, my legs were sore. But the change was enough for me to increase my rolling average speed from 13.0 to 14.5 mph by maintaining 18 mph or greater at times. I had several dogs chase me during the ride. Usually, a calm “you be good” is enough to keep them back and curious. One dog required a sharper tone as he was clearly headed for my ankle until he learned I could speak and watch him (the bell might’ve been a distraction, too). 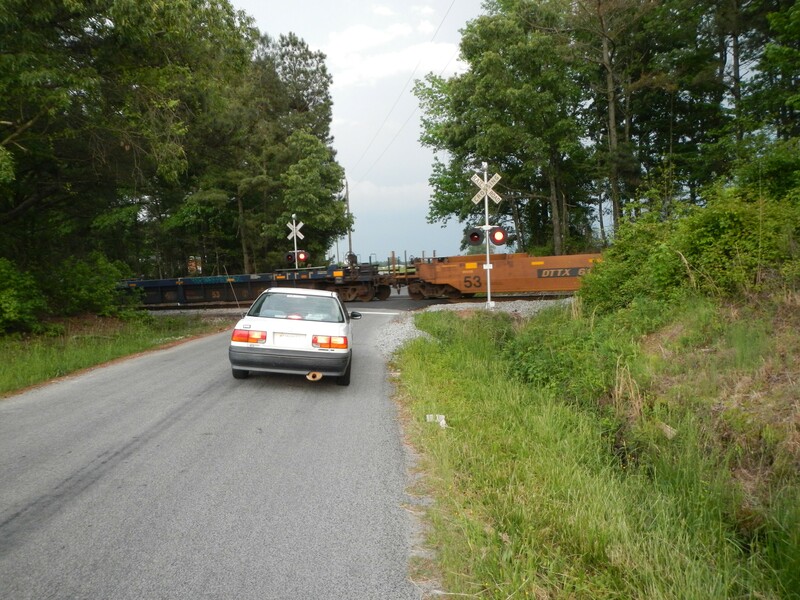 This train held me up for a few minutes. I was pleasantly surprised to see no rain at all! But the bugs at dawn and dusk were AWFUL! Plenty wound up in my mouth or throat! (coughing) I encountered some deer. I found a ring of my bell sent them running away. I guess they hate lights and bells! 🙂 I finished the ride at 10:15, putting my overall average speed at 11 mph. At this pace, I should finish next weekend’s 400 km ride right at 24 hours. UGH! I was really sleepy after the 300. I imagine I’ll be totally exhausted after 400… and I can’t even think about the 600 right now. But it’s coming in a few weeks! I hope I can manage my diet. We’ll see. 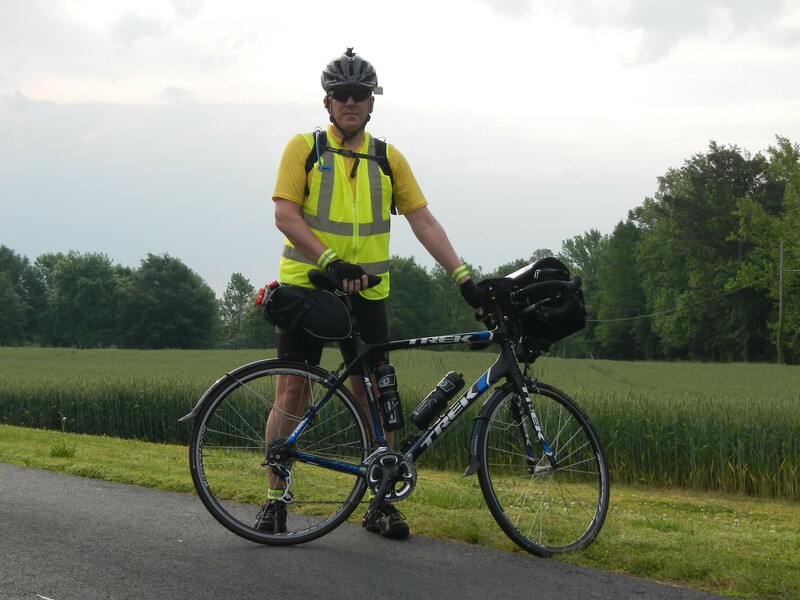 This entry was posted in Brevets (200km+), Super Randonneur Series. Bookmark the permalink. Great write up Scott. Congrats on completing the 300k. Remember the 400k is just a little longer, but considered by most randos as the most difficult because of the sleep factor. Pace yourself, keep eating and drinking and you will be fine. I also remember the small bugs toward the end of the ride. At first I thought they were rain drops, but turned out to be dry. Congrats on your first 300km, Scott. My average time on 400’s is 24 hours, with my fastest being 21h37m and slowest being 26h15m. Don’t get discouraged if it takes longer than you expect. If you start getting seriously drowsy, find a place with some nice hard concrete and take a 15-minute nap. The concrete will help keep you from oversleeping 🙂 As soon as you decide to make a sleep stop, try to eat a couple hundred calories so your body will be recharged when you wake up. Even though you may have been having serious difficulty staying awake on the bike, it’s often the case that when you stop and lie down you feel like you aren’t falling/can’t fall asleep. Just tell yourself it’s OK to fall asleep for a few minutes and let your breathing and heart rate slow down. Usually I fall asleep in five minutes. Ten or fifteen minutes of snoozing can be incredibly refreshing and is usually all I need for the rest of the ride. Thinking back, I finished my first 300k at about the same time of night. My first time having to deal with riding and navigating alone and in the dark. Very difficult. Good luck on the 400k and congratulations on this accomplishment.